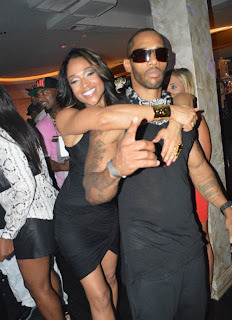 Mimi Faust my favourite star of Love & HipHop ATL and boo Nikko hit up Krave nightclub, and seemed to be having an absolute blast, just like Bambi and Lil Scrappy who were also there that night. Mimi looks super happy. Loving that tatted hench arm there Nikko playa! Lol It would have certainly been the icing on the cake if Joseline Hernandez baby and Stevie J hit the venue too, Oh boy. Stevie still thinks Mimi has got her self a wanna-be Stevie J in the makin! Lool. Fresh. I'm not sure how awkward it would have been for Erica Dixon to see Lil Scrap there with his new boo Bambi, but it doesn't look like she gives a f**k. She looked super pretty sporting long braids and an ankle length royal blue playsuit, showing off her curves. 'A. Lil Scrappy look what chu missin?!' Lol not feeling the yellow lip, she could have gone brave and rocked a blue lip the same shade as her outfit. Would have looked killa with a smokey eye. Hey. Who cares she still looks gorge.